A West Sussex man unwittingly handed over £4,000 to a bogus caller posing as a police officer, Sussex Police has revealed as part of a warning to residents. Police are reminding residents, 'especially the elderly', to stay on the alert for bogus phone calls and visitors after seven cases of courier fraud or attempted fraud in nine days in the Arun and Chichester districts. Calls were received by residents in Bersted, Bognor, Westergate, Chichester and Hambrook, between January 8 and 17, according to police. A police spokesman said: "Thankfully six of the attempts failed due to alert residents, and one case bank staff. But in one case the thieves got away with £4,000. "All attempts failed except one made to a Bognor resident in his sixties on January 15. He went to his bank on instructions from the bogus caller and withdrew £4,000 which was collected by a man in a car later the same day." According to police, in each case, residents have received phone calls from someone claiming to be a 'Detective Chief Inspector Mark Andrews' from London's Charing Cross Police station. "The caller alleges that there has been unauthorised use of a debit or credit card, that someone has been arrested and there is an investigation ongoing," the spokesman added. "The caller later alleged to some of the residents that there was an employee at his bank who was passing fraudulent money through his or her account and that they should go to the bank and withdraw cash, in sterling or Euros, to send to the 'officer' via a courier who would call at their home, to take away for a check on whether it is fraudulent." 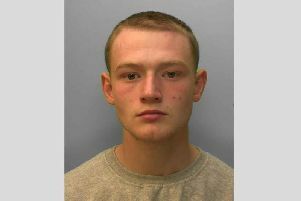 Sussex Police also revealed that an attempt was made to steal £4,000 from an 82-year-old Chichester woman. The spokesman said: "In one of the other six cases the attempt almost succeeded in obtaining £4,000 but was prevented by eagle-eyed bank staff. "The 82-year-old Chichester woman went into her bank in the city to withdraw £4,000 cash as instructed but bank staff become concerned about her welfare, spotted that something was not right, and called the police." Police said officers attended on each occasion and have been 'providing support, including advice and assistance on prevention measures'. PC Bernadette Lawrie, Sussex Police financial abuse safeguarding officer said: "Remember - no police officer, or bank staff on the phone, will ever ask for your bank details or for cash. Don't give your details or cash to anyone in these circumstances! "One of the attempts was prevented due to the good work of bank staff, using the nationally agreed police/banking protocol who has trained bank staff in how to spot the signs of this type of crime." For further advice and information on preventing this type of fraud, see the Sussex Police website. For further information about the banking protocol see here.